It’s true that the most attractive appearance is not achieved when you put all the ultra modern stuff on your body, but when you choose those pieces that suit your figure the best. Regardless if you wear Prada and Armani or affordable classic dress, you’ll look irresistible only if it fits your body shape and accentuate its greatest attributes. Many women struggle to discover the style and particular clothes’ type that’ll look both fashionable and physically adequate, but, in fact, the whole secret is about knowing their bodies. If you are among those who have doubts when choosing clothes to fit their physique or you’re just about to enrich your wardrobe, check out the following suggestions. · Apple shaped body – Your body is the broadest in its middle part, above hips and around the waist, what makes extra weight easily visible. If this is your body - the clothes you wear should expose legs, cover up tummy area and make upper part looking longer. You’re encouraged to wear whole-coloured outfits, dresses and shirts cut under the breast line, belts, above-knees skirts, V-neck wrinkly shirts and blouses and deeper, flat jeans. Stay away from aggressive patterns, too –tight and baggy shirts and dresses. 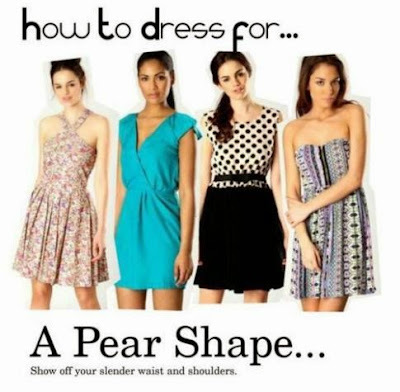 · Rectangular contours – This is when your shoulders’ and hips’ line has almost same broadness as your waist. Don’t be afraid to highlight your shoulders, legs and arms, dress in layers and colours, wear oval- necked tops and blouses enriched with stylish details, create curves with funny belts and deep waist skirts, and embrace skinny pants. Avoid “mannish style” and oversized items. · Pear shape – If you have wide, curved hips, flat belly and significantly narrower upper body, the best option for you are strapless A-line dresses, lower dark-coloured pants, skirts with wide edges, shorter jackets, embellished heart-shaped tops and blouses with boat neck to proportionally widen your shoulders. Distract attention from your hips by avoiding patterns and prints on jeans and skirts. · Hourglass figure – You have curved proportional hips and shoulder along with skinny waist in the middle. Pick skinny jeans, pants and dresses, accentuate your waist with attractive belts, choose pencil skirts and mini tops, actually anything that will underline your curved physique. Don’t hide your figure under wide and multi-layered pieces. The act of choosing attractive womens clothing is tightly related to its colours, materials and patterns, so rely on these little allies when select what to wear. Light and transparent fabrics fit great on harmonious and skinny figure, while you shouldn’t wear outfits made of very thin materials on extra curvy parts and if you have apple body shape, since it creates overexposing and excessively stretch areas. Pick out whole-coloured clothing to hide larger parts of the body, and feel free to dress in brighter apparels to achieve wider hips-line, bust or shoulders. Be careful with funny patterns, because that’s the perfect way to draw attention, so if you, for instance, have broad waist or bigger breasts, patterned and decorated shirts and tops are not so brilliant idea. If you, however like to add brightness and extravagancy to your look, decide for nice accessories and vivid nuances on moderate-shaped body parts. Another smart trick is to improve your chest shape so it doesn’t look flabbily or overemphasized under the dress or blouse. If you’re a “greatly busted” girl, look for bra that will hold your breasts firmly, without visible “over flows” and choose one coloured tops and V-neck blouses to expose your chest in stylish way. Push up bras are excellent for women with rectangular and pear figure, since it boosts upper body area and create curves. You don’t have to abandon your favourite style or fashion trend when searching for clothes that suits your proportions, stay loyal to what you love, but also take care about what your body likes. Good post! 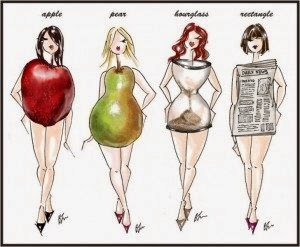 I have been looking at all the beautiful clothing and none fits me because I am like the pear shaped figure. Thank you for sharing these practical info.